For those who insist on returning to their old toxic diet undoing the revitalizing of fasting, here are some tongue-in-cheek suggestions. 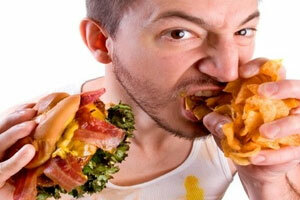 Slowly begin to reintroduce harmful foods. Suggestions are potato chips, pizza with extra cheese, white bread, milk, milk shakes from edible oil products, fried chicken, fries deep-fried in beef fat, eggs from chemically raised chickens, barbecued steak with a small portion of overcooked vegetables. Include lots of coffee and donuts to insure an optimum toxicity level. Eat very few raw fruits and vegetables. If you must eat vegetables, make sure the life has been cooked out of them or buy canned. The best fruits are canned and preserved in sugar syrup. Drink lots of Coke or Pepsi. Canned vegetable juice is fine in small quantities because the enzymes have been destroyed through pasteurization. If you buy fruit drinks made from powder, make sure you see food coloring and synthetic sweeteners and a few unpronounceable chemicals listed in the ingredients. Eat ravenously as if every meal is your last. Swallow food with the least amount of chewing. Eating your meals in less than three minutes will guarantee minimum saliva content. Use butter as a lubricant. Deep-fried foods will also require less chewing. Eat as much as your stomach can take. This forces the muscles that support the stomach to stretch out of shape. Try to eat till you feel stuffed to the point breathing is difficult and sitting requires that you loosen the button of your pants. Mixing proteins, starches, and sugars together with lots of liquid will reduce digestion and increase fermentation, which is necessary to create an achy bloating effect and effective high-powered flatulence. Avoid fiber at all cost. If forced to eat whole-wheat flour, pick the bits of bran from the bread. This will allow the food to pass more slowly through the intestine so the body may absorb optimal toxic chemicals. Do not exercise. Exercise oxygenates the cells and triggers the lymphatic system to cleanse the body. Try to remain in an inactive, horizontal position. TV watching on a sofa is perfect. Try to take as many snacks as possible to the sofa so you do not have to walk back and forth to the fridge. Snack regularly during the night so as to curb the body’s natural tendencies to detoxify during sleep. Attend lots of potlucks for toxic-diet encouragement from others.Do not be embarrassed about going up for seconds, thirds and fourths. Attend every interest carrying donuts and a jumbo coffee in hand in case there is not enough for you. You are one step away from changing your life by reading these true jokes on junk food.